Heat oven to 350°F. In small bowl, place sugar. In large bowl, break up cookie dough. Stir or knead in cocoa until well blended. Shape dough into 64 (1-inch) balls. On ungreased cookie sheets, place balls 2 inches apart. Press each flat, with smooth-bottomed glass dipped in sugar. Bake 6 to 9 minutes or until cookies are set. Cool 1 minute; remove from cookie sheets to cooling racks. Cool completely, about 20 minutes. In medium bowl, beat filling ingredients with electric mixer on medium speed until light and fluffy. Spread about 2 heaping teaspoons filling between bottoms of pairs of cooled cookies. If you’ve never experienced the deliciousness that is chocolate and gingerbread paired together, then you’re in for a real treat! Chocolate gingerbread cookies are a twist on a Christmas classic that adds another favorite flavor to already-amazing gingerbread cookies. 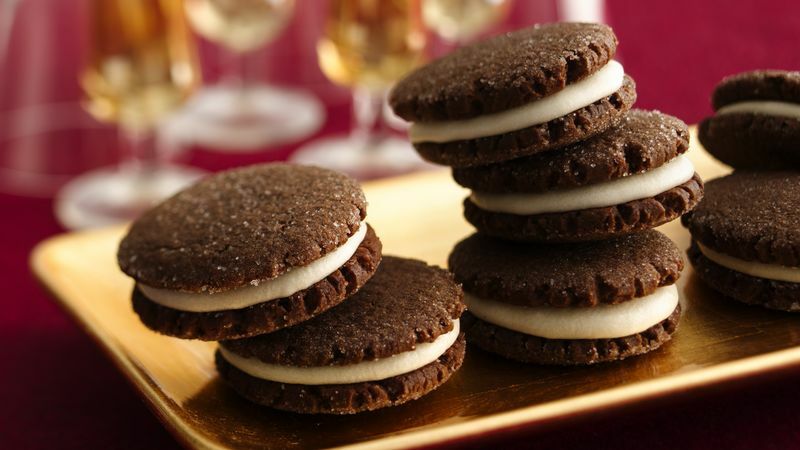 These cookies are filled with a vanilla frosting to make a cookie sandwich. To make these in advance of your cookie exchanges or holiday get-togethers, follow the steps of the recipe through step 3. Then you can freeze the cookies in an airtight container. When you’re ready to serve these cookies, thaw them at room temperature in the container. Then you can make the filling by following step 4. This will ensure that the cookie and the frosting middle will be fresh and ready to impress your guests! Now that you’ve taken care of one batch of cookies, it’s time for more cookie recipes. Not sure where to start? Let’s go over the basics.